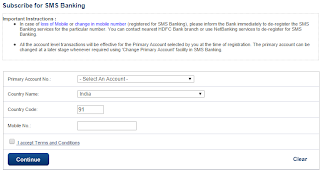 HDFC Bank provides feature to register for SMS Banking online. 1. Login to HDFC Bank using your login credentials. 2. Click on "SMS Banking Registration" link available on top of the website. 3. Select your account,country and enter your mobile number. Check "I accept terms and conditions" box and click on "Continue" button. 4. Now, Click on "Confirm" button to confirm the subscription.